Calling all cookies & cream die hards! Or how about the Peanut Butter Obsessed? And obviously the “I scream, you scream, we all scream for ice cream” people. 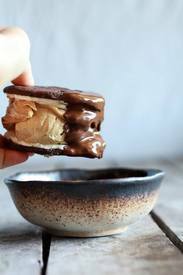 Yes It is.....Chocolate Dipped Homemade Peanut Butter Oreo Mocha Ice Cream Sandwiches! Mmmmm Something in this one for everyone! Don't forget, peanut butter makes everything better...Oh and so does things dipped in chocolate. I think we should just start dipping everything in chocolate from now on. K?